A Mosaic is a unique art form created by assembling hundreds of tiny tiles onto a surface. The creation of a mosaic begins with preparing the surface in order to ensure each tile not only adheres to the surface, but remains affixed for a very long time. Individually, each tile is different in shape, size, texture, and pattern. Collectively, they form a complex and beautiful mural that is admired by many for years to come. Symbolically, our students, represent the individual tiles of a mosaic. Each has their own story with varying degrees of adversity that have shaped their lives like the different shapes, sizes, textures and patterns of mosaic tiles. Together they represent the stories of millions of students in a cohesive, yet multifaceted image. The Center for IDEAs prepares the mosaic’s surface by providing each student the support, resources, and tools needed to thrive academically and to succeed beyond graduation. Lavender Graduation commemorates the accomplishments of Lesbian, Gay, Bisexual, Transgender, Queer, and Ally students. The annual event recognizes their achievements, contributions, and unique experiences at FAU. Urban Male Initiative (UMI) Graduation commemorates the accomplishments of Black/African American Males who actively participated in UMI workshops, retreats and rap sessions aimed at fostering academic excellence. The annual event recognizes their achievements, contributions, and unique experiences at FAU. Reaching Individual Success and Empowerment (RISE) and First-Generation Student Success Graduation commemorates the accomplishments of students that are first in their family to graduate from college, as well as students who have actively participated in the RISE academic success program. 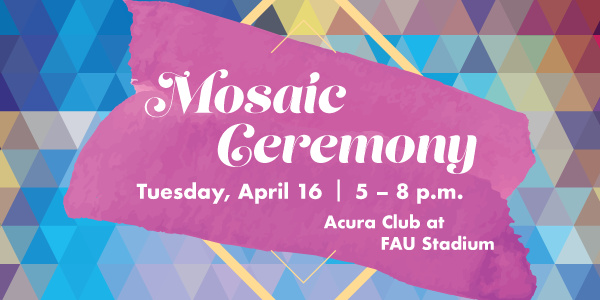 The annual event recognizes their achievements, contributions, and unique experiences at FAU. The FUTUROS Success Graduation commemorates the accomplishments of Hispanic/Latinx students who have actively participated in the FUTUROS Success Program, Bodega Central Series, Comadre Circle, and Lunch and Learns aimed at fostering academic success. The annual event recognizes their achievements, contributions, and unique experiences at FAU. Graduates for May 2019, Summer 2019 and December 2019 at allowed to sign up. If you require a reasonable accommodation due to a disability, please contact the Office of Diversity and Multicultural Affairs at multiculturalaffairs@fau.edu, or TTY Relay Station 1-800-955-8770 at least five (5) business days before the event.